Alongside Britain and Australia, New Zealand was one of the first countries to become involved in the global conflict precipitated by Germany’s invasion of Poland on 1 September 1939. In contrast to its entry into the First World War, New Zealand acted in its own right by formally declaring war on Germany (unlike Australia, which held that the King’s declaration, as in 1914, automatically extended to all his Dominions). This is not an occasion for many words; it is a dark day in the history of the world … It is with deep regret and sadness that I make this announcement on behalf of the Government, and the people will receive it with similar feelings. That will not, however, affect the determination of both Government and people to play their part. 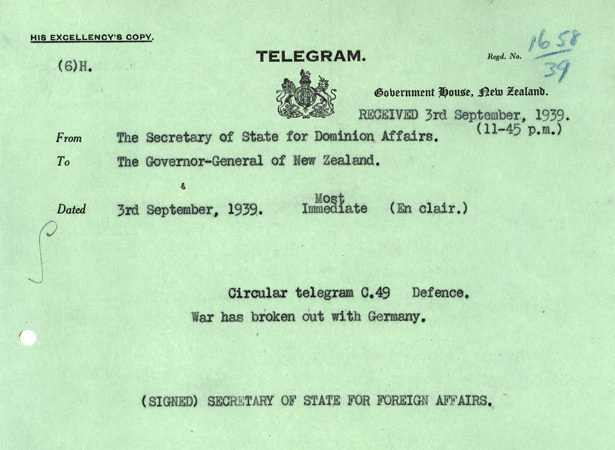 At 1.55 a.m. on 4 September the governor-general, Viscount Galway, cabled the Secretary of State for Dominion Affairs in London to advise that ‘the existence of a state of war with Germany has accordingly been proclaimed in New Zealand’. The proclamation, and Fraser’s statement, were widely reported in newspapers that day. Although it is Prime Minister Michael Joseph Savage’s insistence that ‘Where she goes, we go’ that is most often associated with this period, it was Fraser who led the country during the war. He became prime minister when Savage died on 27 March 1940. We have 9 biographies, 18 articles, related to New Zealand declares war on Germany.